India marks the 45th anniversary of the famous ‘Chipkoo Movement’ or ‘Chipkoo Andolan’ on 26th March 2018. The Chipkoo Movement was non-violence, forest conservation initiative which started in the year 1973 in Uttar Pradesh (Now as a part of Uttarakhand). The Chipkoo Movement was initiated by Sunderlal Bahuguna who is a famous Garhwali activist & environmentalist of India. Sunderlal Bahuguna, current (age 91 years old) is a firm follower of Mahatma Gandhi philosophy of Non-Violence & Satyagraha. He also received prestigious ‘Padma Vibhushan ‘award in the year 2009. The Chipkoo Movement was initiated with an aim to drag people attention in order to prevent deforestation, which was in progress on a big scale to make ways for the construction of dams and roads. In Chipkoo Movement, the word 'Chipko' is a Hindi word which means ‘To Stick’ and the word ‘Movement’ means ‘Andolan’ in Hindi. Therefore it is also referred as ‘Chipkoo Andolan’. Under the Chipkoo Movement, people used to express their unanimity for the movement by surrounding trees and linking their hands together around it, to physically prevent trees being chopped down. The Chipkoo movement was taken forward by women participants, who became a driving force in educating people on the devastating & deleterious effects of deforestation. 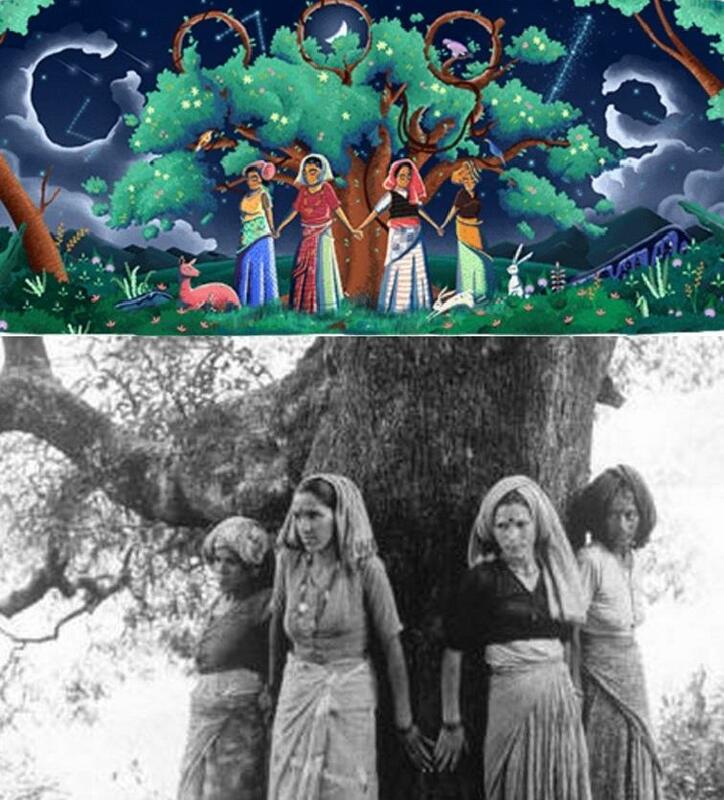 The Chipkoo Movement’s 45th anniversary is also noticed by 'Google’s Doodle' which is showcasing a picture group of women standing around a tree in a forest, their hands linked together, under the light if the moon.